Join me for a reception of the October-November Seattle Realist Artists show in the Hillman City Collaboratory this Sunday evening. Four of my tulip paintings and my new orchid watercolor were selected to be shown as “realist art” along with the work of 11 other artists. This link shows all the works and a video promoting the show. I’m the sole watercolorist of this group! Opening reception 7 p.m. to 9 p.m. Sunday, Oct. 2. Show ends Wednesday Nov 30. The Hillman City Collaboratory 5623 Rainier Avenue South, Seattle, WA 98118. Hillman City is just west of Seward Park in S. Seattle. Monday and Tuesday, 11 a.m. to 2 p.m.
Orchidaceous, painting on the right. Tulip Festival is in full Bloom! 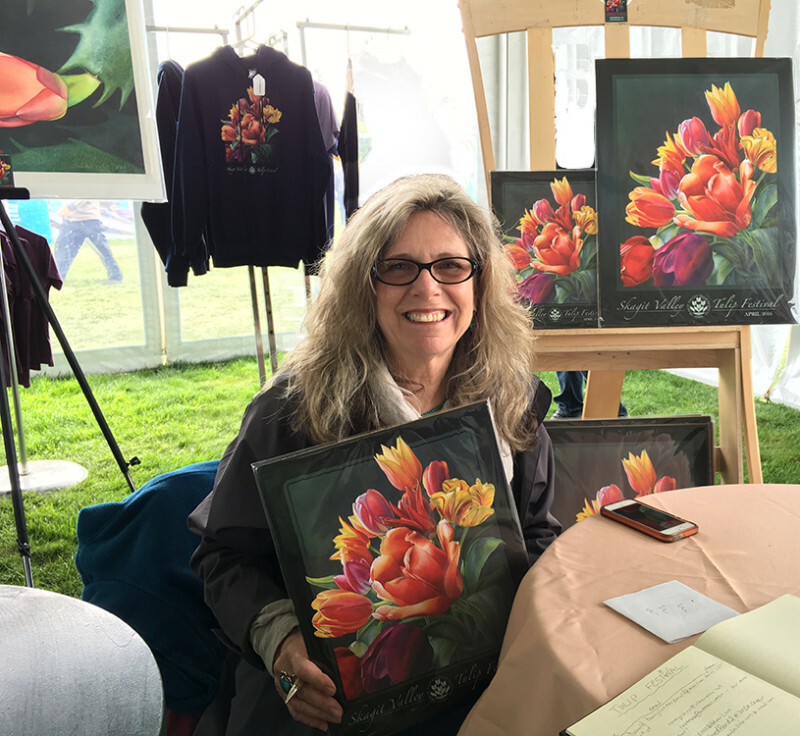 Sandy Haight at RoozenGaarde- 2016 Skagit Valley Tulip Festival poster artist. Photo by Trish Harding, next year’s artist! I survived my first full weekend of signing posters for the tulip fans in Skagit Valley last weekend and looking forward to 2, or maybe 3 more weekends there, depending on the bloom, which was early this year. 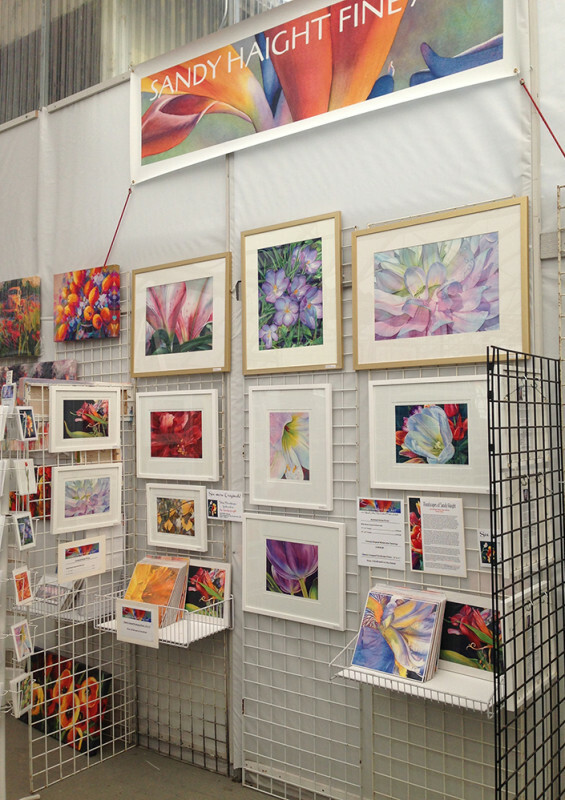 I’ll be at TULIP TOWN Saturday April 9, Sunday April 17, and maybe April 23 just outside the poster shop from 11am – 3pm. I’ll be at ROOZENGAARDE Sunday April 10,Saturday April 16 and maybe April 24 in the big tent behind the gift shop from 11am-3pm. Its crazy busy on the weekends with people from all over the world visiting to see the tulips and order their bulbs for next fall. Diving hint: Avoid driving through the Mt Vernon Kincaid exit to get to these beautiful fields and gardens. Go around and approach RoozenGaarde from the south and west, and approach Tulip Town from Rt 20 to avoid traffic jams unless you are early in the morning. 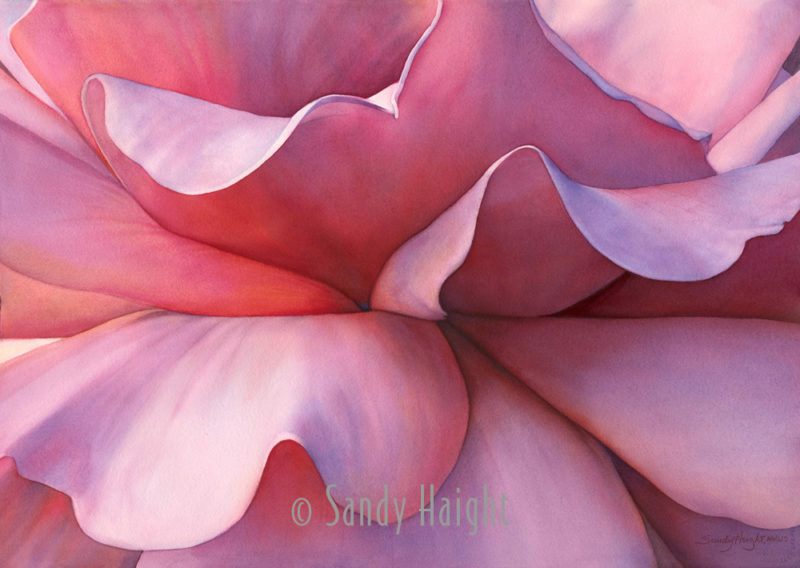 Be sure to go inside the shops to see more of my Floralscapes for sale along with the poster products. 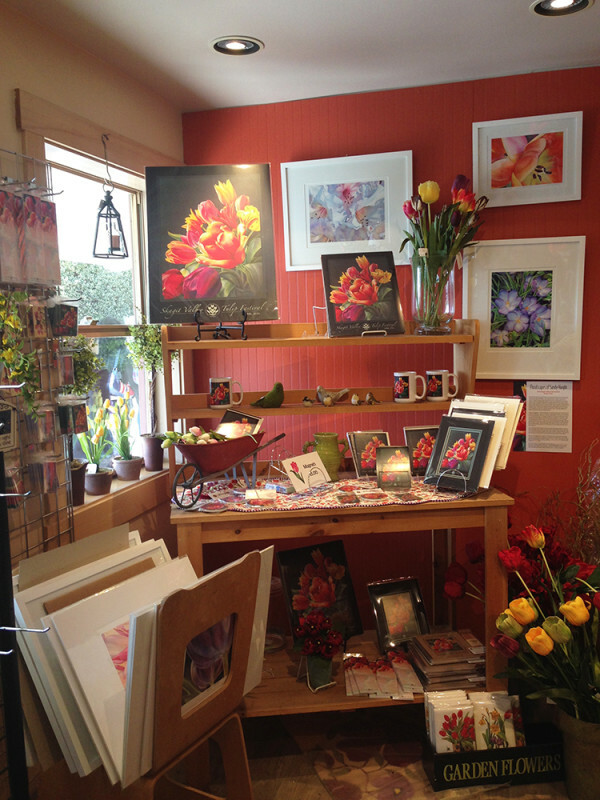 Roozengaard Gift Shop is offering my matted and some framed archival giclee prints of my paintings in the front of the shop with the festival fare and some original sumi paintings of my tulips and irises in another section of the shop, pictured below. RoozenGaarde Gift shop display. Sumi unframed originals available. Tulip Town is a temporary exhibit during the festival and my work is presented in a section of the shop. 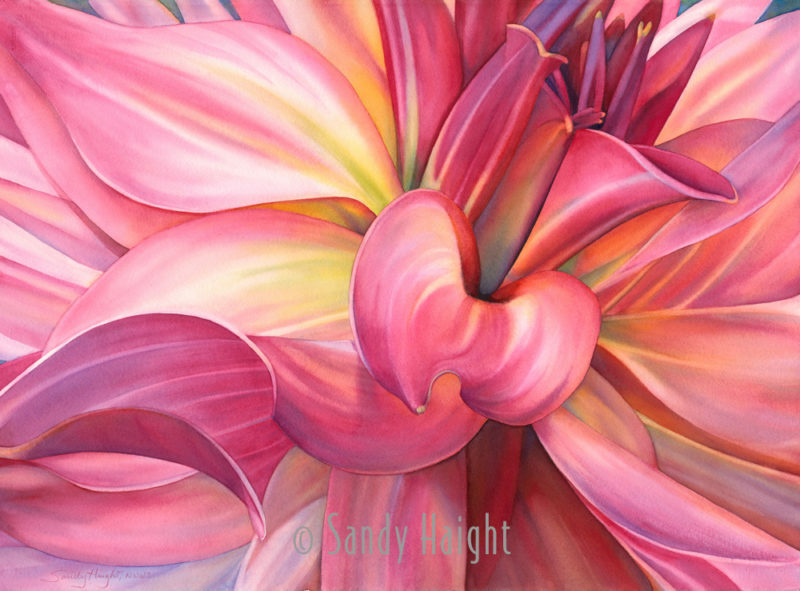 I have some original watercolors, framed archival giclee prints, some cropped prints of my Floralscapes and a rack of cards. 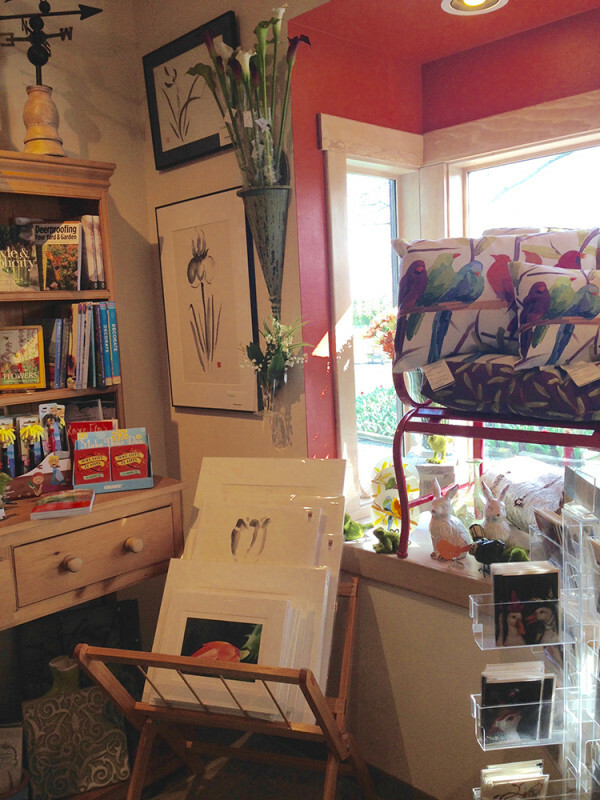 Tulip Town shop display – original watercolors, framed giclee prints, cropped prints, & cards. 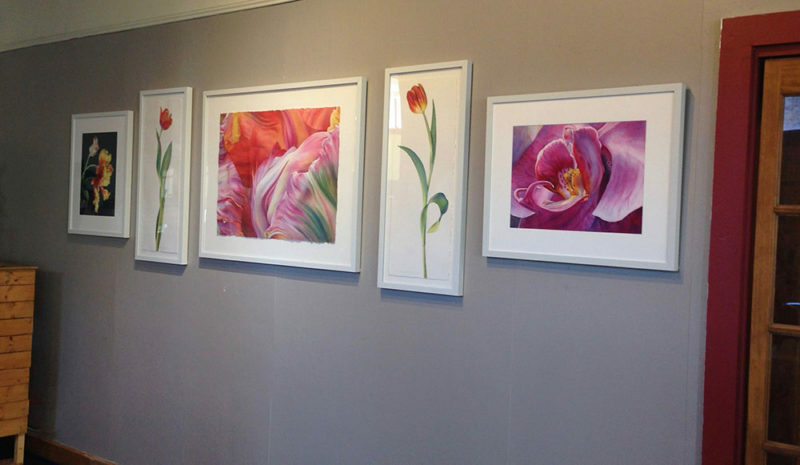 Again, if you saw my last post, don’t miss my exhibit of new tulip paintings at the Scott Milo Gallery in Anacortes while you are in the area. They are open every day but Sunday from 10:30am to 4:30pm. The display looks great and you can see the newest work from the window if you are only there on Sunday when they are closed. Lots of flowers for all this spring!